Starting December 2012 Google Apps is not free any more for new customers. If you got it earlier or don’t mind paying, it gives you a relatively simple way to configure users and groups. We could have assumed they are not individuals, but types of users, but it is enough for demo purposes to stick with the former. Now all emails sent to Support will go to SupportGroup, then to Worker and Boss. The only reason to use SupportGroup vs managing redirects in Support account settings is to manage the list of recipients in one single place and also skip confirming redirects for each single user (you’d still have to do it once for SupportGroup). 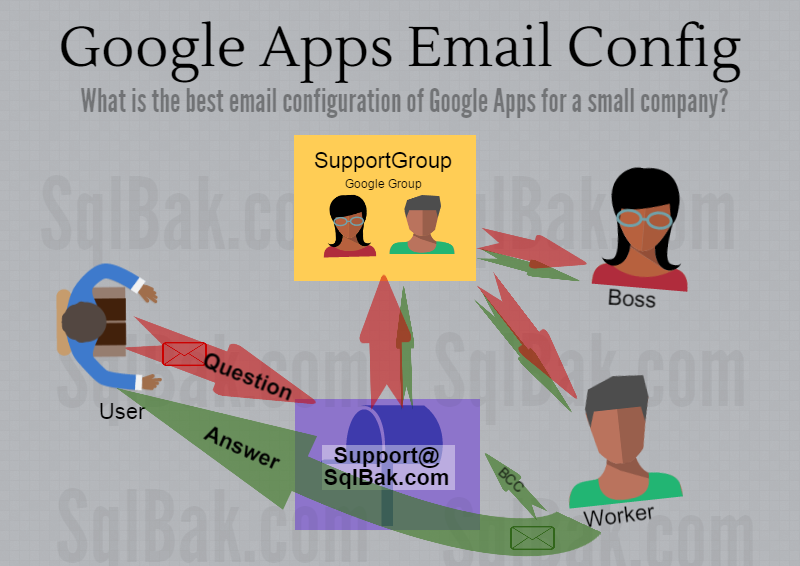 It would also be advisable in Support gmail settings to set deleting mail after it was redirected to SupportGroup. When replying to a client, it would be a good idea to BCC the Support email so the Boss (or whoever is in that group) would receive a copy. Then both Accountant and Boss would add Billing@MyDomain.com as the addresses they own. Now emails sent to Support@MyDomain.com will be received and can be replied from the same address by Worker and Boss. And Billing@MyDomain.com – by Accountant and Boss.